Jane Yolen has been writing science fiction and fantasy for young adults since the 1960s. Her work is generally acclaimed and widely read. Still, Yolen doesn’t take herself particularly seriously, and her work has a lightness to it that is captured by the remark, in her author bio, that “one of her awards set her good coat on fire.” Her resistance to elevation may be precisely what allows her to produce fresh writing, accessible to teenagers, almost 50 years into her career. Yolen makes few updates to the witch, but she adds a new character, the novel’s unnamed protagonist. This young woman flees from her conservative, abusive family, finds the witch in the woods, becomes her servant and her student. Other girls may trick the witch, but this one is here to learn, to become a witch rather than marry the prince. 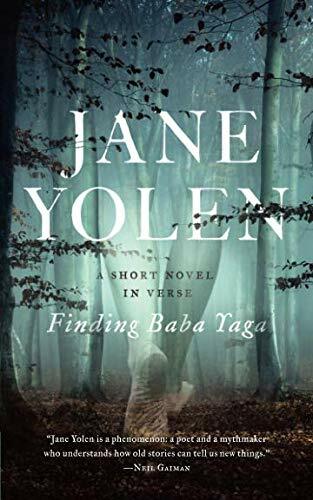 Finding Baba Yaga hovers between its official label, “novel in verse,” and poetry collection. The book has chapters, but those chapters are further divided into individual poems, each titled and self-contained. That decision has strengths. The book can be devoured or consumed slowly, bite by page-sized bite. The poems’ separation allows them to vary in form. Yolen varies her line length, her stanzas, her diction. The poems comment on themselves as individual works even as they interconnect. The weaknesses of this approach are more likely to strike an adult than a young adult reader. Yolen’s need to sustain the narrative means that some poems, particularly early ones, follow only the process of running away. These are necessary to the story, but they don’t have any particular poetic interest in themselves. Later poems are much more powerful. Yolen’s adaptation shifts its fairy tale arc from girl-becomes-princess to girl-becomes-witch. The novel’s heroine is less than enamored of “prince not very charming.” To her, he’s nothing. His very prince-ness erases his individual existence: “he’s the same as all princes / . . . He looks in every mirror he passes / . . . He doesn’t bruise.” What could an intelligent, independent girl want with such a generic creature? Baba Yaga is far more seductive. She is engaging both as an archetype and as a character. The book’s strongest poem, “Baba Yaga Has Tea with Kostchai the Deathless,” focuses squarely on the witch in her natural habitat. Here is dynamic mythology. These ancient creatures know one another. They have a basic kinship, shaped by age and origin, and a wry friendship: “He complains the weather has been too hot, / she says no one uses proper grammar any more, / he says the price of tea is outrageous. / She says someone tried to steal her pestle.” Yet violence frames their meeting. Poison is everywhere. A kiss leaves a scar. The heroine doesn’t come to the witch to learn, escape, and prosper in heterosexual marriage. She comes to stay. She’s finished with the family and with girlhood. Cronehood is more seductive than any prince. Far too much YA writing concludes with romantic union. Even where women have been powerful and central (as in Suzanne Collins’ Hunger Games), marriage and family finally tame them. Yolen is having none of that. She creates a fantasy world that does what fantasy does best: imagines alternate worlds of real freedom and allows her readers entry to those realms.